Background: The main clinical manifestation of senile arteriosclerosis obliterans is lower limb ischemia, which is currently difficult to treat. One method is autologous stem cell transplantation into the muscles of ischemic limbs to improve the formation of new capillaries and restore lower limb blood flow. Endothelial progenitor cell marker CD34+ cell transplantation has been shown to promote angiogenesis in ischemic limbs. Therefore, we propose that peripheral blood autologous CD34+ cell transplantation in older adult patients with atherosclerotic ischemia could effectively promote angiogenesis. Methods/Design: We propose to conduct a prospective, single-center, open-label, randomized, and controlled clinical trial at the Qingdao No. 9 People's Hospital, China. Twenty older adult patients with atherosclerotic lower limb ischemia will be randomized into two groups. In the cell transplantation group (n = 10), peripheral blood CD34+ cells transfected with vascular endothelial growth factor 165 (VEGF165) gene will be transplanted into the muscles of ischemic limbs in older adult patients with atherosclerotic lower limb ischemia. In the control group (n = 10), physiological saline will be injected into the muscles of ischemic limbs. Patients will be followed up for 6 months. The primary outcome will be ankle-brachial indices before and 6 months after transplantation to assess lower limb ischemia in both groups. The secondary outcomes will be the number of microvessels in the lower limb muscles before and 6 months after transplantation, the morphology of new blood vessels revealed by CT angiography, the number of VEGF-immunoreactive cells 6 months after transplantation and the incidence of adverse reactions. Discussion: This trial will begin in January 2018 and finish in December 2019. We aim to quantify the effects of VEGF165 gene-modified CD34+ cell transplantation in the treatment of older adult patients with atherosclerotic ischemia to develop a new effective treatment of lower limb ischemia. Trial registration: ClinicalTrials.gov identifier: NCT03098771. Ethics: The study protocol has been approved by the Ethics Committee of Qingdao No. 9 People's Hospital of China. All protocols will be in accordance with the Declaration of Helsinki, formulated by the World Medical Association. Informed consent: Written informed consent will be provided by participants. Stem cell transplantation has achieved great progress in angiogenesis and collateral circulation in the treatment of arteriosclerosis obliterans. There are two main mechanisms of stem cell action in angiogenesis: (1) Promoting the differentiation and maturation of new blood vessels by homing and integration of stem cells in the damaged vascular plexus. (2) Promoting angiogenesis in ischemic tissue by the paracrine action of vascular endothelial growth factor (VEGF).,,, The discovery in recent years of endothelial progenitor cells in peripheral blood has renewed the concept of angiogenesis. Transplantation of endothelial progenitor cells and bone marrow cells for angiogenesis has become the focus of research. 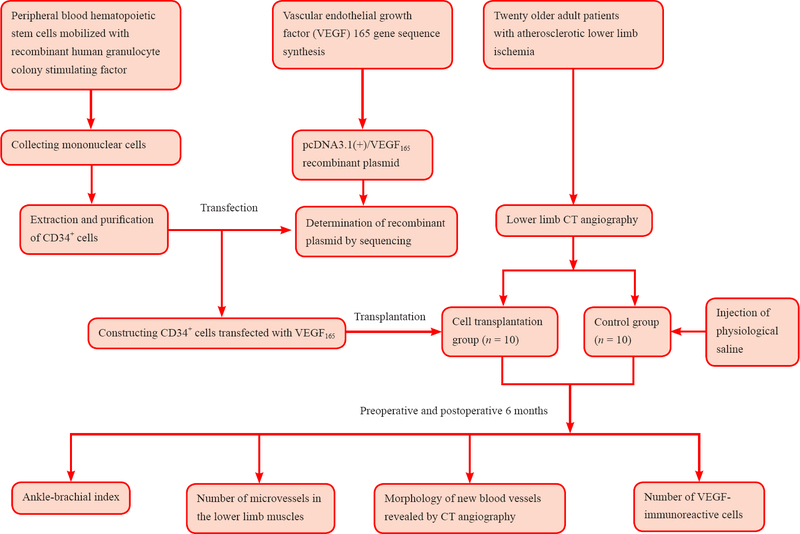 Endothelial progenitor cell and bone marrow cell transplantation have been used to promote angiogenesis in ischemic tissue to treat limb ischemia. Bone marrow stem cell mobilization is used to promote the replication of bone marrow stem cells. This increases the number of endothelial progenitor cells in peripheral blood and the number of stem cells homing on ischemic tissue, thus accelerating the speed and magnitude of angiogenesis. Fujisaki et al. have confirmed that bone marrow cell mobilizers can significantly stimulate bone marrow hematopoiesis and increase the number of peripheral blood stem cells. Bone marrow cell mobilizer-recombinant human granulocyte colony stimulating factor (rhG-CSF) is used to mobilize bone marrow stem cells to the peripheral blood, and to increase the number of peripheral blood stem cells, especially endothelial progenitor cells. This method of treating ischemic diseases is called autologous stem cell transplantation.,  However, the proliferation potential and factors influencing the mobilized bone marrow stem cells and peripheral blood endothelial progenitor cells in ischemic tissue require further investigations in animal and human experiments. We aim to verify angiogenesis in older adult patients with atherosclerotic ischemia after peripheral blood autologous CD34+ cell transplantation. A prospective, single-center, open-label, randomized and controlled clinical trial. Qingdao No. 9 People's Hospital, Qingdao, Shandong Province, China. Twenty older adult patients with atherosclerotic lower limb ischemia will be randomized into either the cell transplantation group or the control group. Bone marrow stem cells will be mobilized by G-CSF. Peripheral blood hematopoietic stem cells will be harvested to extract CD34+ cells. CD34+ cells will be cultured and identified. VEGF165 gene vector will be constructed and transfected into the above CD34+ cells. In the cell transplantation group (n = 10), peripheral blood CD34+ cells transfected with the VEGF165 gene will be transplanted into the muscles of ischemic limbs in older adult patients with atherosclerotic lower limb ischemia. In the control group (n = 10), physiological saline will be injected into the muscles of ischemic limbs. Patients will be followed up for 6 months. The flow chart of trial protocol is shown in [Figure 1]. Figure 1: Flow chart of trial protocol. The study protocol has been approved by the Ethics Committee of Qingdao No. 9 People's Hospital of China. All protocols will be in accordance with the Declaration of Helsinki and the ethical requirements of the hospital for human research. The writing and editing of the article will be in accordance with the Standard Protocol Items: Recommendations for Interventional Trials (SPIRIT is shown in Additional file 1). ClinicalTrials.gov identifier: NCT03098771. The participating individuals will participate voluntarily with the consent of their family members. All donors and recipients will be fully informed of the experimental process, and will sign the informed consent after they fully understand the treatment plan. Patients presenting with all of the following criteria will be considered for study inclusion. Patients with one or more of the following conditions will be excluded from this study. In accordance with our experience, the range of ankle-brachial index (ABI; Appendix 1) of normal persons at resting is between 0.9 and 1.3. We hypothesize that the average increase of ABI will be 0.2 and 0.05 in the cell transplantation and control groups, respectively at 6 months postoperation. Standard deviation of ABI will be 0.3. Taking β = 0.1 and Power = 90% with a significance level of α = 0.05, the final effective sample size of n = 70 per group will be calculated using PASS 11.0 software (PASS, Kaysville, UT, USA). If we assume a patient loss rate of 20%, we will require 84 patients per group. In this study, we aim to include 10 patients in the cell transplantation group and 10 patients in the control group. Inpatients of the Qingdao No. 9 People's Hospital will be recruited. We will explain in detail the contents of the study and precautions. Potential participants can contact the project manager via telephone. After providing informed consent, these potential participants will be screened using the inclusion and exclusion criteria. A random number table will be generated by a computer. Patients will be numbered and will be arbitrarily determined on the random number table. The 20 patients will be equally and randomly assigned to two groups. Patients, physicians, and assessors will not be blinded to group information or the therapeutic regime. After mobilization with rhG-CSF for 4 days, peripheral blood hematopoietic stem cells will be harvested from patients using Baxter Fenwal CS-3000 Plus Blood Cell Separator, and centrifuged with Ficoll (relative density of 1.007). Mononuclear cells will be collected and incubated on HFN-coated plates with M199 medium containing fetal bovine serum and VEGF for 7 days. Cells will be incubated with CD34-PE-labeled monoclonal antibody at room temperature for 15 minutes. Flow cytometry will be used to determine and mobilize CD34+ cells in hematopoietic stem cells after incubation. Cells will be processed using CliniMACS CD34 Reagent System. The morphology of adherent cells will be observed under an inverted microscope. Adherent cells labeled with DiI-acLDL and FITC-UEA-I will be observed with laser scanning confocal microscope. The synthetic VEGF165 gene sequence will be cloned into 55pCR2.1-TOPO vector. After checking with sequencing, the sample will be cloned into the eukaryotic expression vector pcDNA3.1(+) to construct recombinant plasmid pcDNA3.1(+)/VEGF165. The pcDNA3.1-hVEGF165 plasmid will be amplified and extracted, identified with double enzyme digestion and sequencing, and then transfected into CD34+ cells. Reverse transplantation-polymerase chain reaction will be utilized to detect VEGF165 mRNA expression in CD34+ cells. 3-(4,5-Dimethylthiazol-2-yl)-2,5-diphenyltetrazolium bromide assay will be applied to determine the effects of VEGF165 transfection on CD34+ cell proliferation. VEGF165-transfected CD34+ cells (1 × 106/L, 10 mL in one limb) will be intramuscularly injected into the ischemic limb in the cell transplantation group. Physiological saline (10 mL) will be intramuscularly injected into the control group. The injection will be carried out at 10 sites in both groups. The ratio of the blood pressure at the ankle to the blood pressure in the upper arm (ABI) will be used to assess lower limb ischemia before and 6 months after transplantation in both groups. The range of ABI of normal persons at rest is between 0.9 and 1.3. Abnormal results: less than 0.8 represents moderate arteriosclerosis obliterans; less than 0.5 represents severe arteriosclerosis obliterans. The ABI of intermittent claudication patients is mainly between 0.35 and 0.9. The ABI of rest pain patients is often less than 0.4, and the patient will be at risk of amputation. ABI of more than 1.3 indicates vascular wall calcification and loss of vascular contraction. The number of microvessels in the lower limb muscles before and 6 months after transplantation: Immunohistochemical staining will be measured in five fields, randomly selected under a high power microscope (× 400). A higher number of microvessels after 6 months indicates the generation of more new blood vessels. The number of VEGF-immunoreactive cells: Immunohistochemical staining will be applied to observe cell number 6 months after transplantation. A high number of VEGF-immunoreactive cells indicates more new blood vessels. Incidence of adverse reactions: Postoperative complications will be recorded after the 6 months of transplantation to evaluate the safety of the procedure. We will record adverse events, including fever, infection, lower limb pain and ulcers, during follow-ups at the outpatient clinic. If severe adverse events occur, investigators will report details, including the date of occurrence and measures taken to treat the adverse events, to the principle investigator and the institutional review board within 24 hours. Data collection: Case report forms will be collected and processed using Epidata software (Epidata Association, Odense, Denmark), collated, and recorded electronically using a double-data entry strategy. Data management: The locked electronic database will be accessible and locked only by the project manager. This arrangement will not be altered. The Qingdao No. 9 People's Hospital, China will preserve all data regarding this trial. Data analysis: A professional statistician will statistically analyze the electronic database and will create an outcome analysis report that will be submitted to the lead researchers. An independent data monitoring committee will supervise and manage the trial data, ensuring a scientific and stringent trial that yields accurate and complete data. Statistical analysis will be performed using SPSS 19.0 software (IBM, Armonk, NY, USA) and will follow the intention-to-treat principle. Normally distributed measurement data will be expressed as means, standard deviation, minimums and maximums. Non-normally distributed measurement data will be expressed as the lower quartile (q1), median and upper quartiles (q3). Count data will be expressed as a percentage of adverse reaction. Kolmogorov-Smirnov test will be used to determine the normality of measurement data. If data obey the normal distribution, ABI, the number of microvessels in the lower limb muscles and the number of VEGF-immunoreactive cells will be compared using a two-sample t-test between the two groups. Intragroup difference of above indicators will be compared using paired t-test before and 6 months after transplantation. If data do not obey the normal distribution, intergroup and intragroup data will be compared using the Mann-Whitney U test and the Wilcoxon signed-rank test. The incidence of adverse reactions will be compared with Fisher's exact probability test between the two groups 6 months after transplantation. The significance level will be α = 0.05. The trial is in the design stage. Subject recruitment is scheduled to start in January 2018. The primary outcome measure analysis, and all tests will be finished in December 2019. Few studies concern CD34+ cell transplantation in the treatment of lower limb ischemia in loder adults. An in-depth investigation of the effects of VEGF165-modified CD34+ cell transplantation for treating this condition in older adults will help to develop a new model of treatment. Gene transfection, in vivo CD34+ cell transplantation, immunohistochemical staining and CT angiography will be used to explore the effects of VEGF165-modified CD34+ cell transplantation for treating senile atherosclerotic lower extremity ischemia. This trial aims to test the efficacy and safety of CD34+ cell transplantation for treating senile atherosclerotic lower extremity ischemia. Addltional flie 1: SPIRIT checklist (PDF 48.1 kb). Rodrigues CG, Plentz RD, Dipp T, et al. VEGF 165 gene therapy for patients with refractory angina: mobilization of endothelial progenitor cells. Arq Bras Cardiol. 2013;101:149-153. Cangiano E, Cavazza C, Campo G, et al. Different clinical models of CD34+ cells mobilization in patients with cardiovascular disease. J Thromb Thrombolysis. 2011;32:1-8. Sasaki KI, Chibana H, Ueno T, Itaya N, Sasaki M, Fukumoto Y. Successful endovascular treatment of aortoiliac bifurcation stenosis using an empirically based T and protrude-stenting with self- and balloon-expandable stents. Kurume Med J. 2017. doi: 10.2739/kurumemedj.MS6300010. Zhuang JM, Li X, Li TR, Zhao J, Luan JY, Wang CM. Randomized controlled trial to superficial femoral artery recanalization for lower extremity arteriosclerosis obliterans. Beijing Da Xue Xue Bao Yi Xue Ban. 2017;49:153-157. 2014 JAPAN Critical Limb Ischemia Database (JCLIMB) Annual Report. Ann Vasc Dis. 2016;9:374-391. Balbi C, Piccoli M, Barile L, et al. First Characterization of human amniotic fluid stem cell extracellular vesicles as a powerful paracrine tool endowed with regenerative potential. Stem Cells Trans Med. 2017. doi: 10.1002/sctm.16-0297. Manjunathan R, Ragunathan M. In ovo administration of human recombinant leptin shows dose dependent angiogenic effect on chicken chorioallantoic membrane. Biol Res. 2015;48:29. Park IS, Chung PS, Ahn JC. Enhancement of ischemic wound healing by spheroid grafting of human adipose-derived stem cells treated with low-level light irradiation. PLoS One. 2015; 10:e0122776. Zhao P, Chen Y, Yue Z, Yuan Y, Wang X. Bone marrow mesenchymal stem cells regulate stemness of multiple myeloma cell lines via BTK signaling pathway. Leuk Res. 2017;57:20-26. Fujisaki J, Wu J, Carlson AL, et al. In vivo imaging of Treg cells providing immune privilege to the haematopoietic stem-cell niche. Nature. 2011;474:216-219. Orrico C, Pasquinelli G, Foroni L, et al. Dysfunctional vasa vasorum in diabetic peripheral artery obstructive disease with critical lower limb ischaemia. Eur J Vasc Endovasc Surg. 2010;40:365-374. Tan K, Lessieur E, Cutler A, et al. Impaired function of circulating CD34(+) CD45(-) cells in patients with proliferative diabetic retinopathy. Exp Eye Res. 2010;91:229-237. Taguchi A. Cell-based therapy for patients with vascular dementia. Psychogeriatrics. 2011;11:113-115. Yoo CH, Na HJ, Lee DS, et al. Endothelial progenitor cells from human dental pulp-derived iPS cells as a therapeutic target for ischemic vascular diseases. Biomaterials. 2013;34:8149-8160. Li CH, Chen Y, Zhang CH, et al. Observation of clinical efficacy of rt-PA intravenous thrombolytic treatment for patients combined with grade 0-1 diabetic foot by Wagner classification and acute ischemic stroke. Eur Rev Med Pharmacol Sci. 2016;20:5168-5173. Zhang H, Lei C, Zhang TY, et al. Transcutaneous electri cal acupoint stimulation with different acupoint combinations on opioid consumption in patients undergoing off-pump coronary artery bypass grafting: study protocol for a randomized double-blind controlled trial. Clin Transl Degener Dis. 2016;1:17-24. Study concept and design, drafting of the manuscript, study supervision and final approval: CHZ. Experiment implement: CHZ, XJT, LLX, MJG, BL and PZ.